Director: Diego A. Pizzagalli, PhD. Using a multi-modal approach spanning different levels of analyses (e.g., environment, genes, brain, behavior), lab members are working towards a better understanding of the causes, consequences, and pathophysiology of depression. One of lab’s main goals is to improve our understanding of functional, structural, and neurochemical brain abnormalities in depression. This information will be critical for developing better treatments, identifying individuals at increased risk for depression, and uncovering markers that could be used to guide treatment selection. Anhedonia—the loss of pleasure or lack of reactivity to reward—is one of the core symptoms of depression, and has been considered a potential trait marker related to vulnerability to depression. Surprisingly few studies have utilized laboratory-based measures to objectively characterize anhedonia. The overarching goal of this line of research is to employ a variety of techniques, including electroencephalography (EEG), event-related potentials (ERP), functional magnetic resonance imaging (fMRI), molecular genetics, as well as psychological and pharmacological manipulations to advance our understanding of the neurobiological substrates of anhedonia. Admon, R., Pizzagalli, D.A. (2015). Corticostriatal pathways contribute to the natural time course of positive mood. Nature Communications. 6:10065 doi: 10.1038/ncomms10065 (2015). Auerbach, R.P., Pisoni, A., Bondy, E., Kumar, P., Stewart, J.G., Yendiki, A., Pizzagalli, D.A. (2017). Neuroanatomical prediction of anhedonia in adolescents. Neuropsychopharmacology, 42, 2087-2095. Pechtel, P., Pizzagalli, D.A. (2013). Disrupted reinforcement learning and maladaptive behavior in women with a history of childhood sexual abuse: A high-density event-related potential study. JAMA Psychiatry, 70, 499-507. Pizzagalli, D.A., Holmes, A.J., Dillon, D.G., Goetz, E.L., Birk, J.L., Bogdan, R., Dougherty, D.D., Iosifescu, D.V., Rauch, S.L., Fava, M. (2009). Reduced caudate and nucleus accumbens response to rewards in unmedicated subjects with Major Depressive Disorder. American Journal of Psychiatry, 166, 702-710. Pizzagalli, D.A. (2014). Depression, stress, and anhedonia: Toward a synthesis and integrated model. Annual Review of Clinical Psychology, 10, 393-423. One of lab’s main goals is to improve our understanding of functional, structural, and neurochemical brain abnormalities in depression. This information will be critical for developing better treatments and for identifying individuals at increased risk for depression. Our research has shown that there are specific patterns of brain activation that correspond to individual differences in treatment response, depression severity, anxiety symptoms, and phenotypes of depression. This line of work relies on an integration of various neuroimaging approaches, including electroencephalography (EEG); functional and structural magnetic resonance imaging (fMRI); and positron emission tomography (PET). Kaiser, R.H., Andrews-Hanna, J.R., Wager, T.D., Pizzagalli, D.A. (2015). Large-scale network dysfunction in Major Depressive Disorder: Meta-analysis of resting-state functional connectivity. JAMA Psychiatry, 72, 603-611. Kumar, P., Goer, F., Murray, L., Dillon, D.G., Beltzer, M.L., Cohen, A.L., Brooks, N.H., Pizzagalli, D.A. (2018). Impaired reward prediction error encoding and striatal-midbrain connectivity in depression. Neuropsychopharmacology, 43, 1581-1588. 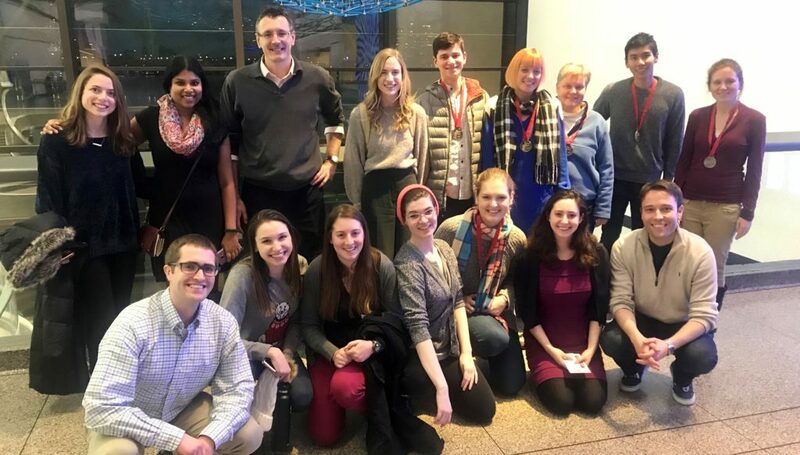 Treadway, M.T., Waskom, M.L., Dillon, D.G., Holmes, A.J., Park, M.T.M., Chakravarty, M.M., Dutra, S.J., Polli, F.E., Iosifescu, D.V., Fava, M., Gabrieli, J.D.E., Pizzagalli, D.A. (2015). Illness progression, recent stress and morphometry of hippocampal subfields and medial prefrontal cortex in Major Depression. Biological Psychiatry, 77, 285-294. Webb, C.A., Dillon, D.G., Pechtel, P., Goer, F., Murray, L., Huys, Q.J.M., Fava, M., McGrath, P.J., Weissman, M., Parsey, R., Kurian, B., Adams, P., Weyandt, S., Trombello, J., Grannemann, B., Cooper, C., Deldin, P., Tenke, C., Trivedi, M., Bruder, G., Pizzagalli, D.A. (2016). Neural correlates of three promising endophenotypes of depression: Evidence from the EMBARC study. Neuropsychopharmacology, 41, 454-463. Whitton. A.E., Van’t Veer, A., Kakani, P., Dillon, D.G., Ironside, M.L., Haile, A., Crowley, D.J., Pizzagalli, D.A. (2017). Acute stress impairs frontocingulate activation during error monitoring in remitted depression. Psychoneuroendocrinology, 75, 164-172. We are interested in investigating executive dysfunction in depression, especially abnormal reactions to errors and negative feedback. It is clear from several studies that depressed individuals show a catastrophic response to errors, evident in a rapid downward spiral in performance following error commission. Studies from our laboratory were among the first to show that these behavioral impairments are linked to an exaggerated, automatic neural response to errors, along with weak recruitment of brain regions that implement cognitive control. Ongoing studies in the laboratory are testing the hypothesis that these dysfunctions foster the emergence and maintenance of negative processing biases, and thus increase vulnerability to subsequent episodes of depression. Dillon, D.G., Wiecki, T., Pechtel, P., Webb, C., Goer, F., Murray, L., Trivedi, M., Fava, M., McGrath, P.J., Weissman, M., Parsey, R., Kurian, B., Adams, P., Carmody, T., Weyandt, S., Shores-Wilson, K., Toups, M., McInnis, M., Oquendo, M.A., Cusin, C., Deldin, P., Bruder, G., Pizzagalli, D.A. (2015). A computational analysis of Flanker interference in depression. Psychological Medicine, 45, 2333-2344. Holmes, A.J., Pizzagalli, D.A. (2008). Spatio-temporal dynamics of error processing dysfunctions in Major Depressive Disorder. Archives of General Psychiatry, 65, 179-188. Pizzagalli, D.A. (2011). Frontocingulate dysfunction in depression: Towards biomarkers of treatment response. Neuropsychopharmacology Review, 36, 183-206. Our laboratory was the first to show that pre-treatment resting EEG activity in the rostral anterior cingulate cortex predicted therapeutic improvement 4-6 months later in depressed individuals. To follow up on this key finding, our laboratory is currently exploring novel behavioral and EEG markers that could be used to examine treatment response prospectively, ultimately leading to improvements in treatment selection. Given that a substantial percentage of depressed individuals do not respond to standard antidepressant treatments, establishing predictors of treatment response could greatly facilitate treatment selection, thus reducing the personal suffering and socio-economic burden associated with the current trial-and-error approach to treatment. Pizzagalli, D.A., Pascual-Marqui, R.D., Nitschke, J.B., Oakes, T.R., Larson, C.L., Abercrombie, H.C., Schaefer, S.M., Koger, J.V., Benca, R.M., Davidson, R.J. (2001a). Anterior cingulate activity as a predictor of degree of treatment response in major depression: Evidence from brain electrical tomography analysis. American Journal of Psychiatry, 158, 405-15. Schematic diagram showing the different patterns of connectivity and activation observed in healthy and depressed subjects. (a) When confronted with an experimental challenge, healthy subjects show increased direct coupling between the dorsolateral prefrontal cortex (DLPFC) and rostral and dorsal areas of the anterior cingulate cortex (rACC and dACC; arrows 2 and 3). 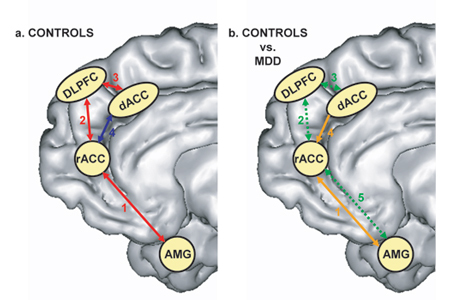 (b) Confronted by the same challenge, depressed subjects show relatively weaker coupling between the frontal and cingulate cortices (arrows 2 and 3), but abnormally elevated connectivity between rACC and dACC (arrow 4). This dysregulation may underlie maladaptive forms of rumination, and poor response to treatment. For a full description of this model, see Pizzagalli (2011).